Bodyweight exercise is probably the most under-appreciated tool out there for losing weight, building muscle, and staying healthy. Every day, millions of people waste time and money on expensive gym memberships and home workout equipment when there is an easier, more practical solution right under their noses. Don’t get me wrong-I’m not saying that you can’t get great results from working out at a gym, or from exercising on in-home workout equipment. If you can stick with that kind of program, and you’ve got the money, the time, and the room, you can do very well. I’m simply saying that for many people, these solutions are impractical, and they end up paying monthly for memberships at fitness centers they don’t go to, or paying for weights and equipment that end up collecting dust in storage somewhere. Meanwhile, a tiny fraction of that same investment-if spent learning about bodyweight exercise-could give vastly better results. Many people think that bodyweight exercise is just not challenging enough to give you a good workout-they see it as more of a warm up than anything else. Well, there certainly are easy bodyweight exercises that can be used to warm up. There are also exercises, like muscle ups and one leg squats, that many weight-lifters and other athletes cannot even perform for a single repetition. Don’t underestimate the value of this type of training program. Once you know what the more advanced bodyweight exercises can do for you, you’ll have a workout routine that you can use conveniently for your entire life-whether you’re at home or on the road, whether you’ve got two hours free to work out, or only 15 minutes. This kind of convenience means that sticking to a schedule is easier and more practical than ever, because you don’t have to make time for the gym commute–you only have to make time for the exercise itself. Most people fail to appreciate, when it comes to getting fit (and staying that way), that anyone can build the “perfect” schedule or routine. You know what I’m talking about-the routine that’s supposed to transform you into some kind of bodybuilder/super-hero crossed with an Olympic gymnast. Unfortunately, most people cannot plan their lives around such a routine, and if they try, they end up failing, and getting even more discouraged and out of shape. What really counts is not making the perfect plan, but creating a solid plan that you will actually stick to. That’s what’s so great about bodyweight exercise-unlike so many other options, it’s both effective AND practical. If you’re brand new to bodyweight exercise, or exercise in general, you may want to try my other book on the subject, Natural Exercise. It’s geared more toward beginners. 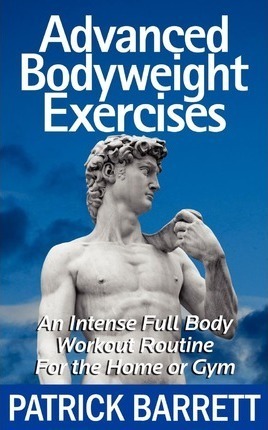 However, if you’ve already read that book, or you’re just ready for more of a challenge, then Advanced Bodyweight Exercises is exactly what you need. You’ll learn all the exercises (and variations) you need to build real strength to last a lifetime. So pick up your physical or digital copy of Advanced Bodyweight Exercises, and start exercising right away for less than the cost of a single dumbbell, or one-day gym pass.